Wedding welcome gift bags are the perfect way to say a special thank you to out of town guests who are traveling to share your special day with you. Whether you are having a destination wedding or simply blocking out hotel rooms for your guests, it is a good idea to include a little something special to say thank you. Wedding gift bags will not only make your guests feel appreciated and thought of but they are a great way to add a custom touch to your wedding. But keep in mind not every gift bag is created equal. Many come in the form of bags, baskets, reusable totes, and even boxes. Even more different are the items you can put inside of your welcome bags. When deciding what to include in your wedding gift bags for hotel guests, take into consideration the overall theme of your wedding. 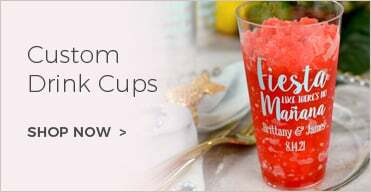 For example, if your wedding is themed around a season like Fall or Winter, then include seasonal related items in your gift bags like hot cocoa favors or leaf shaped soaps which will help coordinate your gift bags in with your wedding. Other ideas for what to include in your wedding gift bags can range from the hangover helper kit to local souvenirs and everything in between. To help you narrow down the perfect items for your guest gifts bags, we've included some of our favorite ideas. Whether you are having a destination wedding or a backyard wedding, those unfamiliar with the area will love getting local memorabilia to take home with them. Include maps of the area and transportation maps for guests who may be staying the whole weekend. Don't forget to mark any spots that are of particular interest. Items that are famous to the area are the perfect complement to an OOT wedding gift bag and help polish the look of a welcome bag. Hawaii wedding? Include real flower leis in each gift bag. Vermont wedding? Small bottles of local maple syrup will add to atmosphere of your wedding. Chicago wedding? Throw in some coupons from famous pizza places in the area or favors printed with the well known city skyline. New Orleans? Celebrate Louisiana's French heritage by including fleur-de-lis related souvenirs in your bags. Ohio wedding? Chocolate candy buckeyes will resemble the state's tree and well known college football team. Cape Cod Wedding? Include nautical themed items like sailor knot keychains and lighthouse memorabilia. 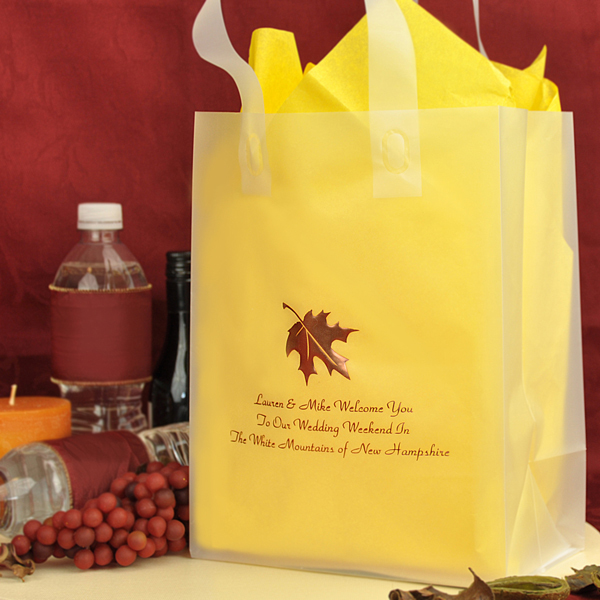 Your welcome bags are the perfect spot to include all the important details about your wedding. Be sure to include your itinerary for the weekend and any contact phone numbers for guests that may have questions. 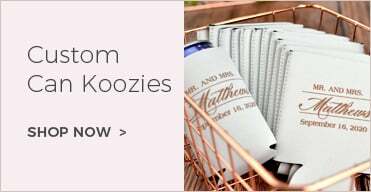 Throw in a personalized koozie, a signed mix cd of your reception songs, or a photo of the bride and groom with a hand written message on the back so guests have a small token to remember the day with. The Hangover Helper Kit has been increasing in popularity throughout the years and typically consists of everything you'll need to fend off the dreaded post-party hangover. To pull off a hangover kit, include items like a bottle of Coca-Cola, Aspirin, Water, gum, and Pepto Bismol or Tums. Add a pair of cheap sunglasses to the kit for a few laughs. A $5.00 gift certificate to Starbucks or McDonalds will be much appreciated for those looking for a coffee fix or greasy relief. Food, Snacks, and Necessities - Include small snacks like crackers, chips, and cookies in your wedding gift bags for guests to munch on after their long flight or during the transition before your reception. These snacks also come in handy as late night munchies. 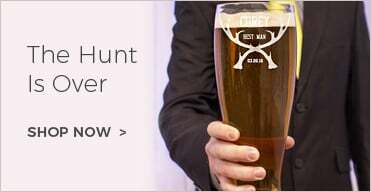 Add other fun items like local magazines and mini bottles of wine or liquor. If there will be children attending the wedding, include a coloring book with crayons for them to enjoy. Lastly, don't forget toiletry items. While these functional items may be easy to overlook, many times they are the items that get the most appreciation. Handy mini sewing kits will be a life saver for popped buttons. 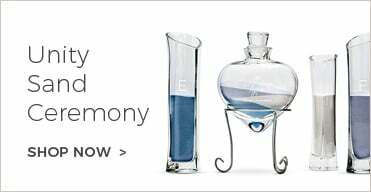 Other necessities like travel tissues, Chapstick, lint rollers, sunscreen, toothpaste and mouthwash are just a few must-haves your wedding guests will be thanking you for. Once you have filled your with all your collectibles, snacks, and goodies, the last thing to consider is where to place the bags. Many couples will have the hotel staff place one or two gift bags in each of the hotel rooms that have been blocked out for their wedding. You can also have the hotel staff hand a gift bag to guests as they check in to the hotel. Another option is to set out your gift bags on the lobby table with a wedding sign instructing the guests of your wedding to take a bag with them. If you prefer not to leave your welcome bags at the hotel, consider setting your bags out at your wedding reception. A nice table decorated to match your reception would look great piled with your wedding welcome bags. Add a sign instructing guests to take a bag with them as they leave your reception. 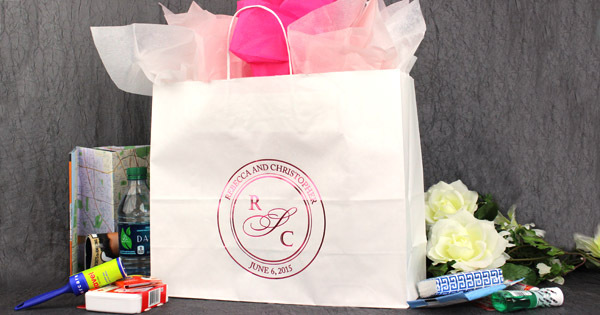 Lastly, personalized wedding gift bags can double as your guest favors. Set a gift bag out at each guest place setting or hang your bags from the chairs tied with a coordinating ribbon for a unique approach towards your welcome bag presentation.